This is an interview I did with Wendy of the Perfect Pickler. Originally it was a podcast that has now since been taken down, but the information was good so I created a transcript! I purchased the perfect pickler myself and had questions on how to use it so I contacted the makers. Wendy graciously agreed to speak with me. I recorded and the following is a transcript of the main parts of our conversation. I know canning and Wendy knows fermenting! We had a great discussion. What is fermenting compared to canning pickles? Sharon So Wendy, I guess my first question for you is, "Do you want to go over basically what fermentation is and the difference between that and the type of pickling that I usually do which is more of the regular, quick, fresh pack pickle?" Wendy: OK, which is a form of canning, correct? Wendy: OK. All right. So basically, fermentation is an Old World method. It goes back to I guess the earliest recordings of the Great Wall of China, but it uses the microvilli action of beneficial bacteria to bring down the pH to a level where the spoilage organisms cannot survive. So we're actually creating an environment where they (beneficial bacteria) will proliferate and then they will bring the pH down and that will take care of all spoilage organisms. I guess another way that you can explain the way that process works, we use salt and when you mix salt with water, it actually makes the water unavailable to spoilage organisms. Spoilage organisms need moisture. So it's kind of cool that when you mix the salt with the liquid, with the water. Then the spoilage organisms, they're just stuck. They can't do anything because they don't have any moisture available to them and they just remain stuck until the beneficial bacteria who don't mind that amount of salt begins to proliferate and they bring down the pH and once it gets below 4.7, the spoilage organisms just die. They can't survive and they die. This process of fermentation takes on average about four days. After that's completed, you can open that jar, close it, open all you want because the pH is low enough in the actual liquid or the solution of the pickle that it's going to keep. You're not going to have to worry about spoilage organisms because they cannot live in there, which is pretty cool. Sharon: I know that we - when I do my canning, I'm always looking at pH and that's why you have to use the pressure canner for something versus just the water bath but this makes sense - this affects the pH of the food also but just in a completely different way. It's not heat. It's just the salt in there. Is that correct? Wendy: Well, the salt makes the moisture unavailable but the beneficial bacteria bring the pH down. Yes, but the exciting thing is when they bring down the pH, they actually multiply like crazy, producing a probiotic benefit for us. So just one-fourth teaspoon of sauerkraut actually gives the body 40 million colonizing units of beneficial bacteria and Dr. Mercola recently published an article saying that one bowl of fermented veggies has the same amount of probiotics in an entire bottle of probiotics. So that's a huge amount. Sharon: Yeah, and I'm sure it's natural and so it has got to be way more healthy. Wendy: Yeah, and you can have a broader spectrum of strain, especially using different vegetables in different succession like each day, certain strains will dominate and then they will kind of slow down. Then the next day, another strain will dominate. It can kind of get different mixtures of strains. There are all kinds of different probiotic organisms. So while these good, beneficial bacteria are proliferating, they actually want to consume the rich carbohydrates that are in the brine, the liquid that kind of came off in the vegetables. The salt helps to draw that out too but they don't have a digestive system so they create enzymes that spill out of their bodies and the enzymes such as the carbs. Then those get ingested back into the bacteria. So the bacteria are not the only thing that proliferates. It's generating enzymes the entire time. So you also get an enzyme supplement, in addition to a probiotic supplement by doing this Old World process of fermentation. Sharon: I've done just a miniscule amount of reading about fermenting foods. I don't know a whole lot about it. I haven't gotten into it too much but I didn't realize that there were so many different things going on in there. Wendy: Yeah, there are and one - there's a couple more that I will get to. I don't want to throw them all out at once. But these just have more benefits. 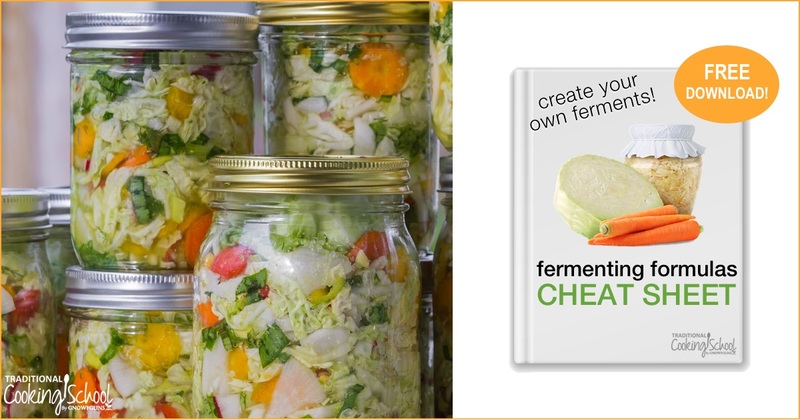 How does the Perfect Pickler compare to fermenting foods in a crock? Sharon: Well I was just going to say that I've tried doing some fermenting just in a crock and it ended up looking so gross that I thought this can't possibly be right. It's a little bit different than the canning that I'm used to. So when I saw your product to do fermenting vegetables in a canning jar. it was just interesting to me. How does that work differently than what you just do in a crock? Wendy: Basically the fermentation process is the same but our system makes it goof-proof. So that little lock that you're talking about on the top, it's called an air lock and the water that you put inside of there prevents any airborne yeast from getting down into the jar and then it allows any building up or escaping gases to bubble up and get out through that air lock. So it's just kind of an exchange. The gas can get out but the yeast can't get in and sometimes like what you talked about with some of it not looking good, if yeast settles in and gets into your open Crock, you have some exposure to oxygen which means some of the yeast in the air can settle down into what you're trying to ferment. That can produce what is called the bloom where you get kind of these things growing on top that don't look very desirable and it can also give off flavors and they can give a slimy texture. They don't necessarily spoil it or make it bad but they don't make it real desirable and traditionally you just scoop that off and then would still eat the rest of it. But I thought, I don't really want to do that. So that's what I love about the Perfect Pickler. It just becomes a goof-proof system that's so user-friendly. It just illuminates those factors, so that's what I enjoy about it. Sharon: Right. I think that's probably the position I ended up in as I knew to expect stuff to come on the top that I would have to scrape off. But then my food itself just got that slimy texture and that's when I realized, "I don't know if I'm doing this right. Before I start feeding this to my family, I better know what I'm doing." Wendy: Oxygen could have been the reason that you got yeast and temperature can also be the reason because when you first seal off your jar, there's going to be some yeast in there just naturally occurring and if you have that Perfect Pickler to warm up the temperature, the yeast that was in there will be encouraged to flourish. So temperature is also a factor. You want to keep them below 74 really. The ideal temperatures are between 64 and 74. Sharon: That might have been an issue because it was in the summer and I tried to find a cool location in my car port but it could be that it just wasn't cool enough. Wendy: Yeah. Well, the good thing too is you can just use a thermal pack, one of those big thermal bags. Like you might shop at a big grocery store you're at and you can just put your jars in there with an ice pack and swap them out every 12 hours and that will keep the temperature. Even in the summer it will keep it down to 72 and that will produce a nice fermentation result. Sharon: Right. Oh, I put some cabbage in mine just yesterday. I have just off my kitchen, I have a little room. We call it the mud room. It's kind of a back entry and it stays cool back there. So in your instructions that come with the Perfect Pickler, it has instructions on there on like what temperatures to keep it at. So I was a little bit more aware that I need to keep it cool. I'm excited to see how it turns out. Wendy: It's fun to watch. I do enjoy that because I used to use an old world Crock and it was dark and I couldn't see what was going on and in fact a couple of times, I've gotten an air leak and I didn't know I had an air leak because I couldn't see through the Crock. So I do really enjoy being able to see what's going on and to watch it. It is a lot of fun for the kids. Sauerkraut in particular has some beneficial strains that the better tasting ones will flourish at a cooler temperature. That's what I was trying to say. So sauerkraut in particular turns out tasting a little bit better if you can do it at a little cooler temperature. So a thermometer is a great thing. If you have a thermometer that you could just put next to it and you will know which temperature it is where you place your fermenting vessel. Sharon: Yeah, I do. I have a thermometer out there because that's where I store my canned goods also and they do better at a cooler temperature. So I'm always kind of watching that. Wendy went on with a lot more information. Remember the batch of sauerkraut that I mentioned getting started…. Well I can report it turned out great! No slime, no mold to scrape off. Clean and easy peasy.